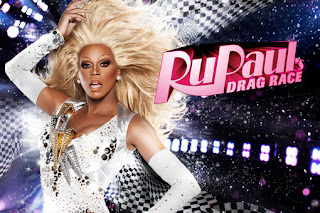 Come January, your Mondays will be such a drag when RuPaul's Drag Race returns with a third fabulous season! According to a Logo press release, the upcoming season features "[b]igger name guest judges, “OMFG” challenges and higher stakes" than ever before. Not to mention that the cash prize, which was $20,000 in Season 1 and $25,000 in Season 2, is now a whopping $75,000! You can by a lot of eleganza with that kind of cash. Logo also announced a new permanent judge who will be putting the bass in her walk every week with veteran judges RuPaul and Santino Rice: TV/radio personality Michelle Visage, formerly of the late 80s/early 90s girl group Sensation (you know, "It takes 2 to make a thing go right / It takes 2 to make it out of sight"). Michelle co-hosted The RuPaul Show on VH1, was on RuPaul's radio talk show from 1996-2002 and is apparently replacing former judge Merle Ginsberg, who is not mentioned in the press release (oopsies). She sure is fierce, huh? And that laugh is just as creepy as it is fabulous.